Today I want to write about an amazing frog called the sunset frog. These strange little frogs only grow to about 35 mm long and have very large glands on their back. Sunset frogs get their name from their bright orange feet and belly. These elusive guys were only discovered in 1994 and were first described by scientists in 1997. They breed from late spring to early summer, with the female laying about 100 eggs one-by-one on mats of algae. Sunset frogs are only found in a few sites new the coast of south-west Western Australia. 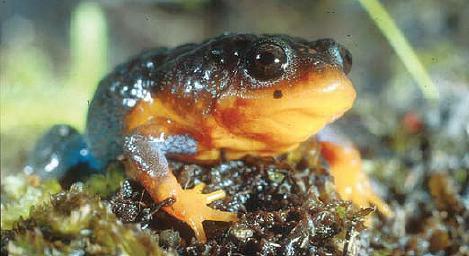 They live in moist peat swamps and are considered vulnerable due to their tiny range and very limited habitat. Are there any other interesting facts that you would like to share about sunset frogs?